The I-95 Express Lanes in Miami are a poorly conceived idea and a very dangerous hazard for drivers and law enforcement. Unfortunately for South Floridians, it is the opinion of our Miami car accident lawyers in Miami that the State of Florida, through the Florida Department of Transportation (FDOT), chose to monetize a main highway in Miami at the expense and safety of all concerned. If you were injured in a car accident in Miami on I-95 or within the I-95 Express Lanes, you should call the I-95 Express Lane accident lawyers in Miami at the Wolfson Law Firm at (305) 285-1115. Our Miami car accident lawyers have served the people of Miami and South Florida since 1963 and we can help you too. 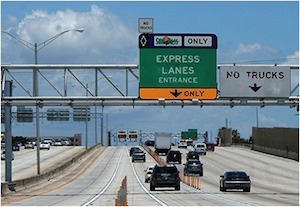 The I-95 Express Lanes in Miami extend 13 miles in the north and south directions. The 95 express lanes are separated by plastic poles. Depending on traffic conditions the tolls for the express lanes on I-95 can reach $10.50. In February of 2016, the 95 express lanes in Miami generated $2.6 million dollars. It is estimated that the Miami express lanes of I-95 have brought in more than $130 million since it was set up. But FHP Troopers and Florida lawmakers are calling for the dangerous poles to be removed. The truth of the matter is that in order for FDOT to make money on these express lanes in Miami, the lanes and shoulders were made smaller. In fact, the shoulders inside the I-95 express lanes in Miami are smaller than the average parking space. The 95 express lane shoulders measure 7 feet and 11 inches. One of the unintended, but easily foreseeable, consequences of making the shoulder so small was a decrease in enforcement by the Florida Highway Patrol due to the dangerousness of simply issuing a ticket on these ridiculously small shoulders in the I-95 express lanes in Miami. If you drive on I-95 in Miami on a regular basis, you know just how hazardous these express lanes can be. In fact, FHP officers tell their friends and family members to avoid driving in the express lane next to the poles due “lane diving” by drivers in the mainline lanes. “Lane diving” is what FHP calls it when a driver crosses the poles to get into the express lanes. Unfortunately, there have been horrible and even fatal car accidents in the I-95 Express Lanes in Miami. Even when there is no accident, “Lane Diving” is a moving violation and can cost you 3 points against your license on top of a $179 fine. The car accident lawyers and personal injury attorneys in Miami at the Wolfson Law Firm handle all of their cases from beginning to the end. In other words, we will be by your side from the first contact through settlement, jury verdict or appeal. We do not refer our cases out to other law firms for the purposes of litigation and trial. In fact, we regularly receive referrals from other law firms as well as requests for co-counsel for litigation and trial purposes. Feel free to call us at (305) 285-1115 and we will happily answer your questions. At the Wolfson Law Firm, our Miami car accident attorneys are here to help you and your loved ones after any type of accident and injury. Our focus is to reach a fair, full and complete resolution of your case as quickly as possible. But we will never sacrifice the value of your case in order to resolve your case. Our Miami personal injury lawyers handle a variety of cases but they know that this is likely your only case. We get it – and we always keep that in mind as we represent you and your family. We encourage you to review our qualifications as well as our recent cases and results. Research us on Google. We also invite you to come to our offices at 3399 SW 3 Avenue in Miami to meet with us and interview us to see if we are the best personal injury lawyers in Miami for your case. We handle all personal injury cases on a contingency fee basis in accordance with Florida Law and the Rules of Professional Responsibility of the Florida Bar. What that means is that you never owe us an attorneys’ fee unless we make a recovery for you. In certain cases, we can even get the insurance company to pay our fees so that you can keep the entire settlement or benefit less any costs expended. If you would like more information, just call us at (305) 285-1115 and we will answer your questions. Our Miami personal injury lawyers serve the good people of South Florida in all of the neighborhoods and communities including South Beach, Allapattah, Miami Gardens, North Miami, NMB, Sunny Isles, Miami Shores, Edgewater, Midtown, Wynwood, Downtown Miami, Little Havana, Coconut Grove, Coral Gables, Homestead and Florida City.